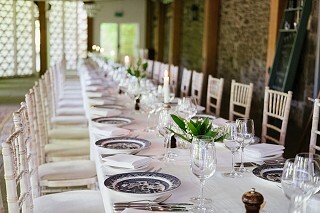 The meal itself would be held in the dining terrace overlooking the gardens (max capacity 140 guests). The dining terrace is clad in opaque glazing shingles and has 16 glazed doors giving views and access to the gardens. It glows in the half light and in the dark as the light diffusion through the shingles is excellent. The roof on the dining terrace is made of crinkly tin and the ceiling is lined with fabric. 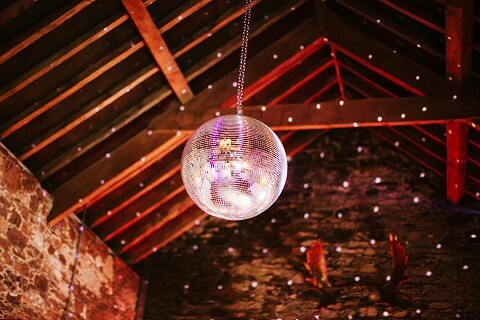 The dancing area and bar are located side-by-side in an old old stone barn which is attached to the dining terrace. Bare-foot or ballgowns, we are happy to accommodate all kinds of weddings. We are delighted to be featured in One Fab Day’s 100 Best Wedding Venues.